There’s something intrinsically appealing about a company that plies its trade as digital media consultants pulling off a coup in the smart phone app area. Wellington Click Suite, an 18 year veteran in the interactive space, “uses our skills for our clients during the day,” says managing director, Emily Loughnan. “We use our skills for our own purposes by night,” though strictly speaking, its Fast, Fresh & Tasty app gets used all during the day; particularly around the 5.30 – 6pm slot as people decide what they’re going to cook for their evening meal. The NZ$5.29 app recently went to the top of Apple’s food and recipe apps (beating Jamie Oliver and Nigella Lawson among others! ), and Loughnan takes great delight in tracking its metrics, plus comments about FF&T through different social media. It’s about now that thoughts of walking the walk and talking the talk filter through the subconscious. FF&T grew out of a Karen Grice idea to set up a kiosk in a supermarket that had recipes. The challenge of being reliant on one of two supermarket chains in New Zealand showed that the business model couldn’t work. The Click Suite goal was to inspire, extend and collaborate with makers of local produce. 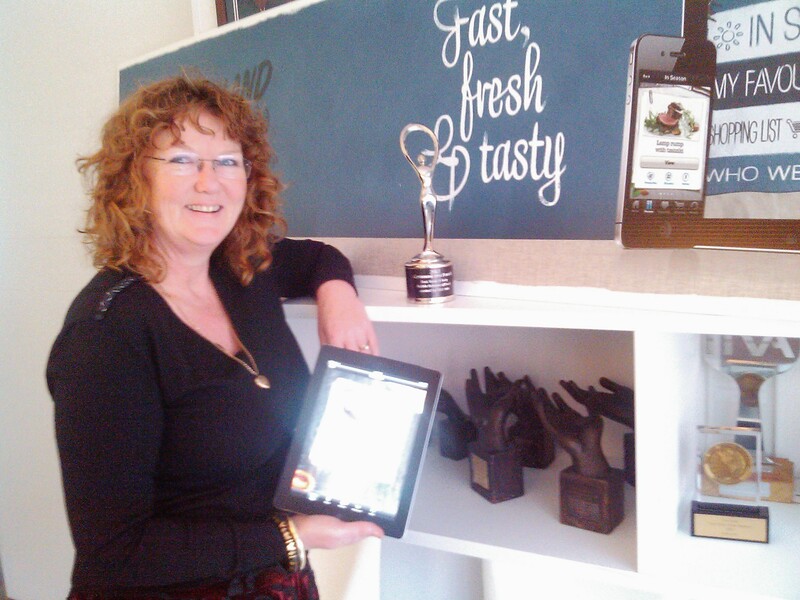 The app is a collaboration with some of these; for example Silver Fern Farms lamb and venison products. The app itself provides a number of routes to solution for the ‘what’s for dinner’ question. Consumers may start with a main ingredient, and can click through to various recipes for say chicken. Along the way a consumer might have an ingredient such as saffron quickly explained. Alternatively, a consumer may be interested in a particular style of food such as a salad, a soup or barbeque food. At the same time as they’re browsing, consumers can add products required for a recipe to their shopping list (as part of the app), which in turn can be texted or emailed to a friend if so desired. However, the killer feature of FF&T, and where none of the global competition has yet gone, is the seasonal approach to providing recipes. The classic hockey stick sales growth graph is proof that the approach is working. Loughnan says that Click Suite went through the same process it applies to outside clients using the digital media company’s services. This included an initial briefing and research as well as testing throughout development using real consumers. Click Suite also made a mock up of what the app could look like on an iPhone (without doing any coding), in order to find out peoples’ priorities for functionality. Loughnan’s clear that FF&T isn’t for every home cook. The app must be doing something right as there were over 12,000 access to it last month alone. FF&T’s up for three awards in the upcoming TVNZ Marketing Awards. It is a finalist in the best new emerging business, best technology and best marketing awards. If they win, expect this to be part of the ongoing story as well.